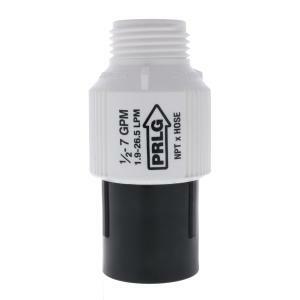 This model PRLG regulates the pressure within your drip irrigation system for optimal performance of your system components. This model connects to a male pipe threaded connection on the inlet side and has a male hose thread connection on the outlet side. The male hose thread outlet makes it easy to connect common drip system kits with garden hose connections directly to the pressure regulator. Choose the appropriate preset PSI rating for your application. The pressure regulator shall maintain the predetermined operating pressure provided the inlet pressure is at least 5 PSI above the expected outlet pressure, but must not exceed the maximum inlet pressure rating. Always install pressure regulators downstream from all shut-off valves. Be sure to install pressure regulators in the proper direction. The arrow on the housing shows the direction of the flow and should always point downstream toward emitters.